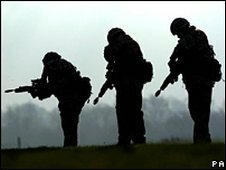 The Territorial Army has been told it must temporarily halt training due to severe pressure on government finances. Drill-hall instruction, weekend exercises and all other TA training are to stop for six months, resulting in savings of about £20m. TA soldiers serve in Afghanistan, but the Ministry of Defence said operations would not be hit as they train with the regular Army before deployment. The TA has about 1,200 troops a year in Iraq, Afghanistan and the Balkans. A Ministry of Defence (MoD) spokesman said: "These are challenging times and like all government departments, we have to live within our means. "We routinely review our spending to balance priorities, focusing on the highest priorities including on our operations, particularly in Afghanistan." A six-month halt to training will also mean soldiers will not get paid. An MoD official said: "Those in the TA get paid for the training that they do. If they don't do any training they won't be paid." TA troops train on one evening a week as well as on some weekends and during a two-week annual camp. The base pay is the same as the regular army. New entrants are paid £33.73-a-day as well as money for their travel, meals, and uniform. Pay rises with rank, with privates receiving £42.07-a-day, corporals getting £65.28 and sergeants on £74.20. Since Labour came to power the TA has fallen from more than 57,000 to a trained strength of about 19,000. In April the MoD announced plans for a major shake-up of the TA, with up to 2,400 Royal Signal posts standing to be cut, with soldiers facing redundancy or redeployment. What now for the 100-year-old TA?